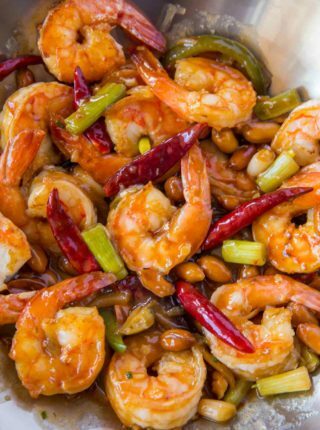 Easy Honey Garlic Shrimp made in one skillet with just five ingredients in just 10 minutes, this dish will replace your favorite Chinese takeout restaurant! I had a pound of shrimp without a plan, so I just did a quick scan of my pantry and realized I had all the same ingredients I needed for Slow Cooker Honey Garlic Chicken. 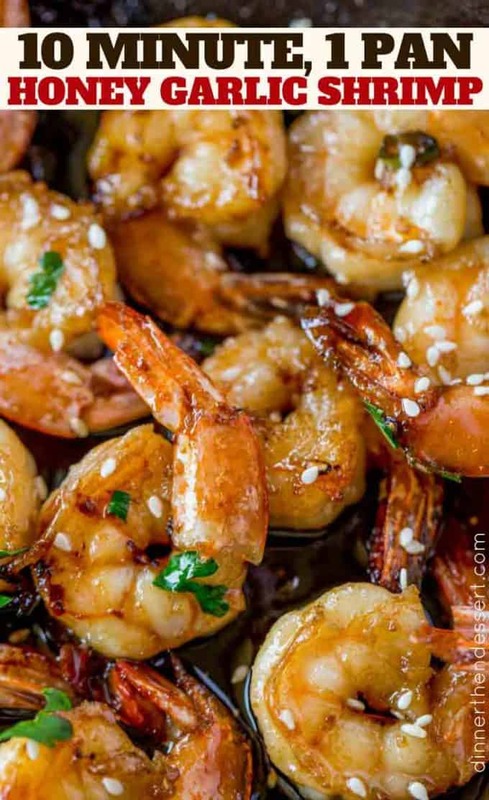 Easy Honey Garlic Shrimp is done in just 10 minutes! 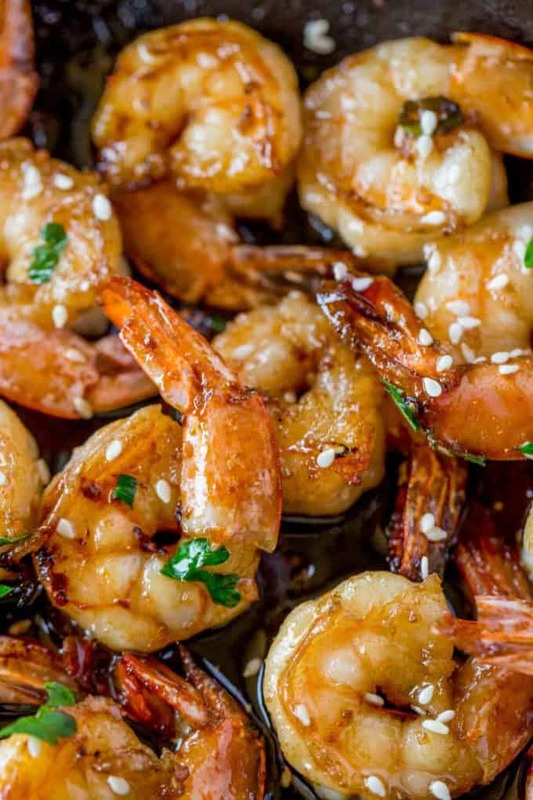 Plus other than the shrimp all of your ingredients are probably in your pantry RIGHT NOW. 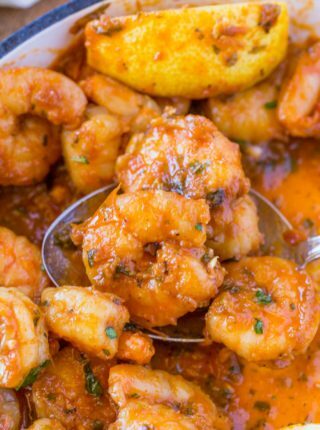 That’s one of the best parts of shrimp recipes, they’re easy. Since shrimp cooks in less than 5 minutes, I like to keep it simple and create flavors in the sauces. 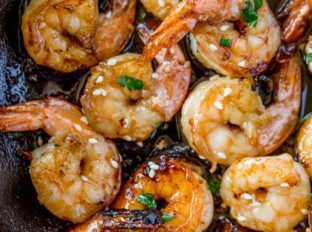 Easy shrimp recipes are a win for us because we save them for days we know we’re going to be busy. 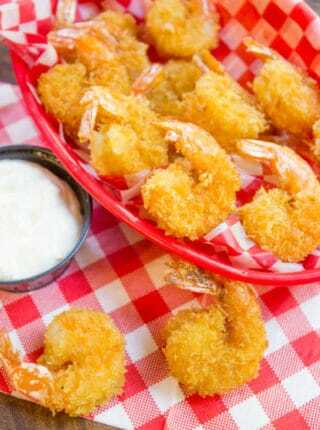 Shrimp: Shrimp recipes can be ready in as little at 10 minutes, quick Asian recipes are a natural fit for shrimp. Shrimp scampi is another easy option. Slow Cooker Recipes: Slow cooker recipes usually take just 15 minutes of prep time and can be made ahead the night before or the morning of the day you want to enjoy them. Ground Beef Recipes: Recipes like Ground Mongolian Beef or Korean Ground Beef are a good example of how easy ground beef recipes can be made in under 20 minutes. Side Dishes: Rice cookers and steamers make side dishes for these main courses above a breeze. Roasted Vegetables: On a high heat, at around 425 degrees, you can roast off most vegetables with little active work and dinner is still on the table in 30 minutes. My favorites are Roasted Root Vegetables. We love pantry dishes like this. The first time we made this dish we were looking for shrimp recipes online because my husband bought more shrimp than I needed for a recipe. I absolutely hate reheating shrimp so I only cooked what we needed. We love this recipe so much now we actually make a quick “takeout” meal a couple times a month of this recipe and my favorite takeout copycat, Mongolian Beef. Both recipes and the steamed rice are done in just 30 minutes, less time than it takes our local place to deliver. 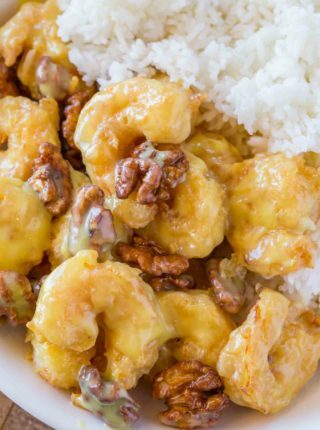 We love Honey Orange Firecracker Shrimp, Bonefish Grill Bang Bang Shrimp, and Panda Express Honey Walnut Shrimp. But none of them are as easy as this recipe. You may notice in the pictures the tails are still on the shrimp. This is for two reasons. 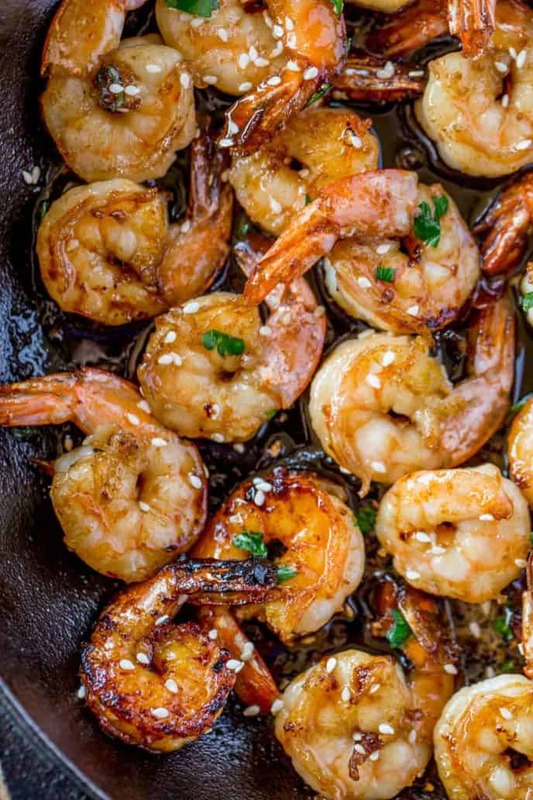 1: It looks prettier and you all enjoy pretty pictures and 2: We often make this dish then stand around the skillet grabbing shrimp and eating them with our fingers like tapas/appetizers. If serving with rice or on a plate of food for your family go ahead and remove the tails before cooking. Add the canola oil to a cast iron skillet or wok on medium high heat. Add in the shrimp and cook for 1-2 minutes on each side. Remove the shrimp, add in the garlic, cook for 30 seconds. Add in the honey and soy sauce, and whisk together. Cook for 1 minute until reduced and add back in the shrimp to coat before serving. Garnish with parsley and sesame seeds if desired. The recipe is great! 10/10. However, my sauce comes out watery typically. Possible explanations? I’m so glad you loved it! It’s never happened to me before so I’m not sure what might have happened since there is so few ingredients. I guess make sure you’re cooking it until it thickens and make sure your shrimp is completely thawed or patted down to remove any excess liquid. Hope this helps for next time. Hi….a simple ingredient with very little ingredients, but it tasted so good! My question is after following your recipe, my sauce was thin, but in your picture, it looked like a glaze, which stuck to the shrimp. Which way is the sauce supposed to look? When I make it again, I would double sauce because I needed more for rice! I’m so glad you loved it! I’m not sure why it wouldn’t have thickened up. Maybe there’s too much liquid coming from your shrimp?? Wonderful recipes, cant wait to get started!! For such a simple and quick recipe with just a few ingredients, it really tasted good! I also added red pepper flakes, as some of comments suggested. Quick question though, I found my sauce was thin -ish, that I poured over shrimp, but in your pic, it looks more like a glaze. Was this sauce supp to be thin or thicker like a glaze? When I make it again, I would also double it. Wanted more sauce for rice! I’m so glad you enjoyed it! The sauce is more like a glaze due to the honey. Next time, make sure after cooking the garlic there isn’t any additional liquid in the pan (it should have cooked off) before adding the honey and soy sauce. If there is, whisk the honey and soy sauce just a bit longer to thicken it up. Hope this helps! Best 10 minute recipe ever. I use half the shrimp and add a vegetable like asparagus or broccoli and it’s incredibly easy and flavorful. Definite keeper. So good. Can’t wait to make it again. Quick easy & yummy. Also made your Korean ground beef. Delish too! Thank you. OMG! I just made this and followed your recipe exactly, and I can’t stop saying how delicious it came out!!! ?? Only thing I did differently was add 1 tbsp of soy sauce instead of 2 because I didn’t have light. Other than that amazing?thank you! Wondering if the shrimp should be thawed before cooking? Many recipes state to cook from frozen. Here, I’m not sure. Yes, you’ll want to use thawed shrimp for this recipe. Enjoy! Great and easy recipe, my husband was skeptical when it came to the amount of soy sauce but turned out awesome! I did add some red pepper flakes. Will definitely make again. Love you recipes, easy to follow!!? Literally just made this with white rice and it is DELICIOUS! I will definitely have to make it again ?! Short prep time, simple ingredients which were already in my pantry and refrigerator, super easy to prepare and simply delicious. I substituted coconut oil for the canola oil, added a bit of freshly minced ginger, some red chili flakes and the juice of half of a lime. I served with steamed broccoli, snow peas, brussel sprouts and yellow bell peppers. I received lots of compliments from my bf on this meal. Will definitely be making this recipe time and time again…..
I’m so glad you guys enjoyed it! Thanks for the 5 stars, Jojo! My site changed over recently to provide the nutritional information so only the more currect recipes have it, sorry about that. I tried this as instructed and the sweet/salty ratio seems to be off along with some depth of flavor. It needs some more umami depth. It’s a quick easy recipe which is what’s admirable about it, decent for the average middle American family. You can definitely customize it to your family’s liking. Well, i know what I’ll be having for dinner tonight! Thank you for sharing this recipe. You had me at honey! Such a great combo with shrimp! Totally agree!! I hope you enjoy it! For the longest time I never made shrimp at home because I had no idea how easy it was. This I will be making soon. So glad this gives you the confidence to try! You got this!! This shrimp looks so juicy! This dish looks mouthwatering, and I’ve already had dinner. adding to my list! gotta try this! You are the honey garlic queen!! These look amazing! Haha, thanks! I’ll wear that crown proudly….the title does come with a crown, right?! ?